AdvancePro v11 is the most powerful and feature rich inventory management system is its class. Building on 15 years of development, AdvancePro v11 will bring out the best in your company. With over 15 new customer centric features, it is the biggest release in the history of AdvancePro Technologies. All ACCP members are eligible for a free upgrade. Why upgrade to AdvancePro version 11? As an ACCP member you are entitled to all AdvancePro upgrades. Using the most up to date version of AdvancePro ensures you have all the new features and enhancement developed for our AdvancePro community. It is critical that you stay on the most recent version of AdvancePro. Upgrading to v11 could address existing issues you may be experiencing with previous releases. Several enhancements to our Quickbooks connect are included in v11. Don’t miss out on QuickBooks optimized features – UPGRADE TODAY. IMPORTANT NOTICE: As of October 31, 2016, AdvancePro will no longer support 32-bit computers. We recommend all local users upgrade their computer system to 64-bit technology. Contact support@advanceprotech.com with any questions. Partial Drop Shipments: Drop shipments are not always delivered in full. AdvancePro now gives you the power to confirm partial shipments and bill your customers accordingly. 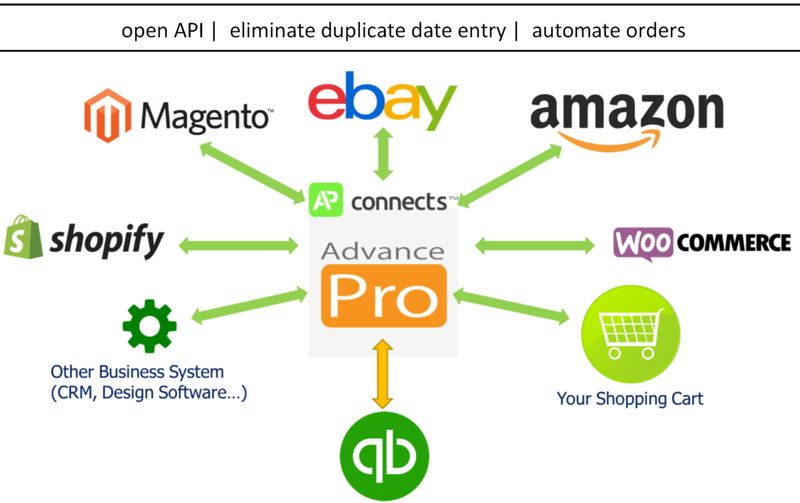 Automated order import from multiple sources: AdvancePro v11 can automate the import of orders from many different sources. Do you sell on multiple websites? Get orders from various channels? AdvancePro can now automatically import those orders directly into the system without any manual intervention. Email Templates: AdvancePro v11 now has email templates that you can configure for Sales Orders, Purchase Orders and VPO Approvals. This can ensure consistency in your communication with your customers and vendors and that critical information is communicated. Vendor Purchase Order Limits and Approval: AdvancePro has introduced the ability to limit the value of a purchase order a user can place. For example, if you set a buyer to have a limit of $5000 per PO, if they place an order for more, their supervisor will get an email requesting approval. This feature can have various levels for different levels of authority. Batch Functionality: If you track products using batches or lots, then the new AdvancePro Batch features will dramatically improve efficiency and tracking. The new Batch Only feature can be configured to require your warehouse staff to track batches from receiving through to shipping and everything in between. With custom user defined fields and expiry notifications, the new Batch feature is ideal for food, pharmaceutical and other distributor and manufacturers. Transfer Orders: Do you operate in multiple warehouses? Do you have stock on delivery/service trucks? Does your business operate on a consignment basis? Then the new transfer orders feature in AdvancePro v11 will make moving a tracking stock a breeze. Simply build up your order in a similar fashion to creating a CPO, create a pick ticket if necessary and receive the stock into another warehouse after transit. All dropdown menus are now searchable, making finding what you are looking for easier everywhere in the software. Website URLs can be configured to use SKUs in the URL. This will enhance your user experience and SEO results. Variants can now be ordered by the user. Sorting variants can be configured by the user. Email VPO to vendor pop-up eliminates a step for processing VPOs. If you email your purchase orders to vendors, you can now email them using the process VPO button. Combined with our email templates, this will dramatically speed up your purchasing. Credit Memos can now show the customer shipping address if required. AdvancePro can now import QuickBooks Sub-items on the initial product sync. Batch Printing has been enhanced to ensure pick/pack/ship tickets are printed in the selected order. Units of Measure have been added to product imports. AdvancePro v11 introduces sample dashboards. Coming soon, AdvancePro will be providing customizable dashboards to users to be able to show the key performance indicators critical to your business. AdvancePro v11 comes with a preview of this feature showing the sales of the top 5 products, top 5 customers sales and a year over year sale comparison report. These reports are currently only available for the Administrator User. Learn everything you need to know about what’s new in AdvancePro Power v11 from our webinar recording. This session will show you the critical new features and give you the opportunity to ask questions to an APT Inventory Expert. Check the box on the registration box below to register for this valuable Webinar. Upgrade today for v11 by filling out the form above. To celebrate the release of version 11, all ACCP Members that upgrade to v11 qualify for up to 50% discount on all new services purchased in September 2016. Terms and conditions: To qualify for this offer you must upgrade to v11 by September 30. The offer applies to all new purchases completed and paid before September 30, 2016. On-site training and Setup for Success services are eligible for 25% discount, all applicable Add-ons and Services are eligible for 50% discount. Hardware, third party software and services are excluded from this offer.